Business Process, Pricing Tables, and Influency? Don’t You Hate Pricing In Columns? We don’t do that here, but we’re happy to talk about it—and why it’s the wrong way to manage business processes. Seriously: they’ll do SEO for you, but they’ll only do it on twenty pages of your web site. And they give you lots of “details”, but it’s a pretty good bet you won’t understand them. 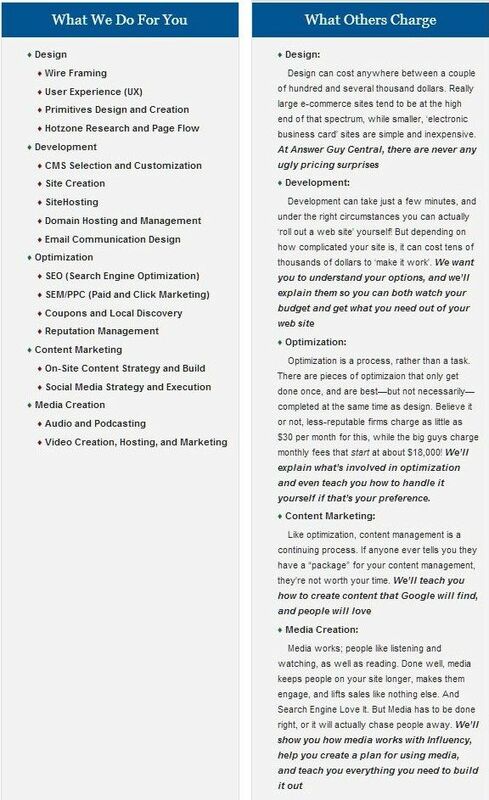 Now look at the pricing: there’s a $2,000 set-up fee no matter which of their plans you buy or how complex—or simple—your web site is! And by the way; there’s no difference between the plans that’s good enough to justify the difference in monthly prices. It’s all made up. But wait a second. “Starting at“? What’s the point of three separate plans with “prices” if you don’t know what the actual prices are? Oh, and by the way: since the low price is more than most people think they’ll pay for SEO and the high price is less than most businesses which realize that professional marketing is not a $50-$100 / month endeavor, these numbers are, very simply, nonsense. 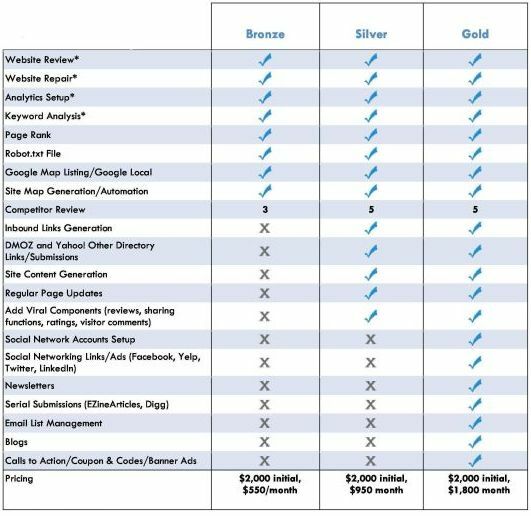 Pricing tables are NOT the way to pick a Search and Marketing consultant, or any other kind of consultant. The truth is, Hubspot has the potential to be a great service, but in most ways their cram-you-in-a-box pricing approach pays off a lot better for Hubspot than for Hubspot clients. That’s it. Contact us, and let’s talk about getting your business processes in order. Not ready to talk? Afraid we’re going to try to fast-talk you into something you don’t want to do or can’t afford? No problem. If we could give you your money back after we spent it delivering you services, we would, but … obviously that isn’t really possible. And by the way: we will get you first-page rankings, but we won’t “guarantee” it—if anyone ever tells you they can; run the other way. You WILL be happy with our work. We WILL get you noticed. We WILL increase both your prominence both in the eyes of Google and other search engines. We WILL increase traffic to your web site. And if you do a lot of other things well (and we’ll help), you WILL see increased revenue. Oh, and just as a kicker: Stay with any of our plans for six months and if you aren’t happy, we’ll work for another two months, for free.